The Daily Digress: Chocolate-covered bacon. Hell yeah. "Oh, dear, you are so healthy. You deserve this little treat. You are so special!" While I was waiting for my salad, a lady came in with a really cute dog, possibly a French Bulldog. Maybe a Pug. I don't know much about dogs, but I liked this one. In addition to having a sweet temperament, it was very stylish. She was talking to the guy behind the counter, lamenting the fact that she had bought bacon somewhere random for her favorite snack. She burned the bacon and figured this was her payback for having been too lazy to make the trek to Ted's. I sympathized, because I think like this all the time. Might need to up the meds. Or not. Ted's is big on bacon. I've actually been to a bacon tasting there, something they host regularly. As you can imagine, a bacon tasting is a fine way to spend an afternoon, especially if you enjoy a glass of wine while tasting eight bacons. And enjoy another one afterwards while having a pedicure at the place across the parking lot from Ted's. But I digress. I half-listened as the lady dropped such intriguing terms as "bacon," "chocolate," "crushed almonds and pistachios," "delicious" and "more bacon." I left with my salad. No sooner had the door closed behind me, I spun on my heel and went back inside. I had to know. "Excuse me," I asked, clutching my salad and trying not to look psychotic, "Can you tell me just exactly what it is you do with the bacon? And chocolate? And almonds or pistachios?" She was happy to answer and I didn't seem to make her nervous in the least, perhaps because she had the dog for protection. Today, I did exactly what she said. S'good. I found a package of bacon in my mother-in-law's freezer. Actually, I found several. I chose one at random. I think it was Oscar-Mayer and contained a reasonable amount of fat. I know that higher-quality bacon from a place like Ted's would be great, but we're here in Litchfield and I don't think the Piggly Wiggly has that. Or the Food Lion. 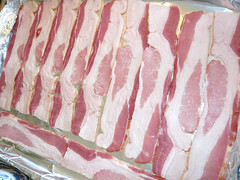 Baking the bacon is the best way to go because you'll end up with nice, flat bacon. So I put the raw bacon on a pan lined with foil. When using other people's pans, you should always line them with foil, because you don't want to mess up other people's stuff. Cook the bacon in a 400° oven for 15 to 20 minutes. Keep an eye on it and take it out when it looks ready, about like this. 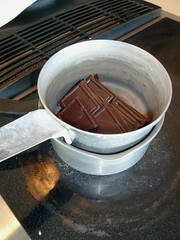 While the bacon is cooking, put some chocolate in a double boiler. If you don't have one, make one by using two pots and filling the bottom one with water. Duh. As far as chocolate goes, fancy is always good. 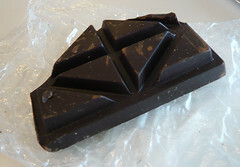 I used this kind by Hershey's, with 60% cacao because it was the fanciest thing the Pig had. After it melted, I realized I needed more chocolate. The Tank was asleep, TF was playing tennis and the big kids were far too engrossed in some trashy television show to be responsible for the Tank while I ran to the store. Also, at the beach, a trip to the store takes like three hours, not seven minutes like it does at home. But I digress. Given that my mother-in-law is French, I knew I would find chocolate somewhere. I found Dibs and Twix in the freezer, but I didn't want to take the time to remove the chocolate. In the back of the fridge, on top of some crumbled cellophane, I found the chocolate below. Although it had been left open, it smelled like chocolate rather than onions or cheese, so I threw it in. "Nobody will admit they like milk chocolate, but they do, so use that with the dark." I went in search of more chocolate. 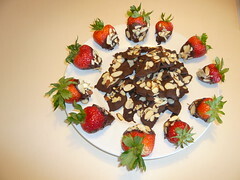 I found these in a drawer and added them to the mix, a lovely assortment of milk and dark chocolate. They were a little harder to melt. 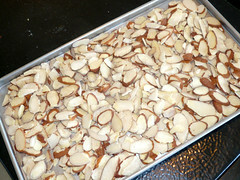 I toasted the sliced almonds with very little fanfare. Aren't you impressed? 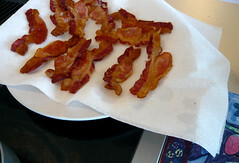 Finally, it was time to start dipping the bacon, which had cooled enough to touch. I wanted smaller pieces, so I cut each piece in half. You know what wasn't cool enough to touch? 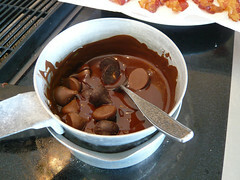 The melted chocolate. That hurt like a b*tch. 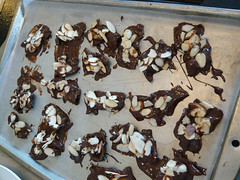 I quickly located some tongs (meant for removing toast from a toaster) and used those to dip the bacon in the chocolate, letting the excess drip off before laying each dipped piece of bacon on a pan lined with waxed paper. 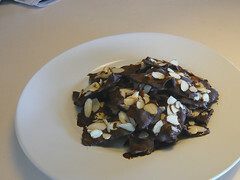 I put the pan into the fridge for about ten minutes so the chocolate could harden. Then I put them on a plate which was only slightly more attractive. Then I felt bad, because the X-Man is a vegetarian and my endeavor seemd unecessarily cruel, so I did the same thing with strawberries. Yum. And, dear reader, we ate them. Those happen to be three of my favorite things that I never considered putting together. I may have to try that. Tomorrow. Thanks! i would like to eat a lot of that a lot. but I wonder... bacon is delicious in the morning with a cup of coffee. chocolate and coffee are natural together. for some reason I'm having some difficulty seeing drinking a cup of coffee with a slice of chocolate covered bacon.